Turkish security forces seized Wednesday explosive substances belonging to the PKK terrorist group in a counterterrorism operation in southeastern Turkey's Şırnak province. Acting on a tip-off, the Provincial Gendarmerie Units conducted an operation in the rural areas of Cizre district with the help of K-9 police dogs. 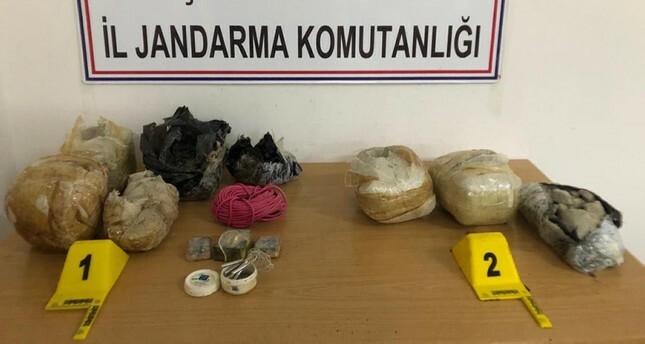 Two backpacks belonging to the PKK terrorists, which were full of explosive substances including 30 kilograms of aluminum powder, 10 detonating caps, three electrical diagram cards, and a 50-meter wick to be used in handmade explosives were seized during the operation. The explosive materials were destroyed by bomb disposal experts. The PKK, listed as a terrorist group by the U.S., Turkey and the E.U., has carried out bloody attacks against Turkey for nearly four decades, causing the deaths of about 40,000 people, including woman and children.